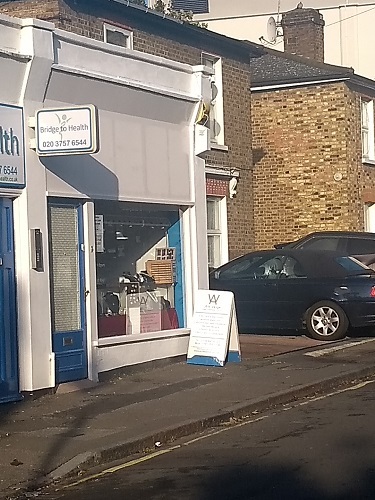 Tucked away on Broomfield Road is an unassuming little shop which would be very easy to miss. However, if you take a minute out of your day, step inside and you will discover an Aladdin’s cave of beautiful jewellery, designed and hand made by craftsman Alfred Winiecki. 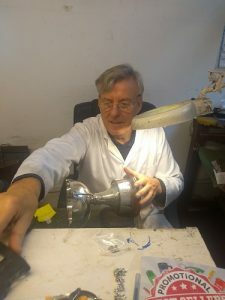 Alfred came from Bydgoszcz in Poland over forty five years ago and learned all about the trade at the esteemed John Cass School of Art in the East End. 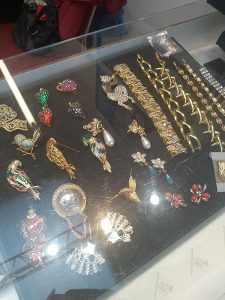 He served out his apprenticeship and then became designer at the vintage British company Sphinx, who made costume jewellery for many famous design houses, including Saks Fifth Avenue, Butler & Wilson Neimans, and Bloomingdales. He set up his own business and workshop in Chiswick originally but soon needed to expand and moved into the West Ealing premises – a former electronics shop – in 1992. Now he can often be found using his artisan skills in the workshop at the back. Alfred’s commissions are mostly from word of mouth recommendations and include all types of bespoke items including engagement and wedding rings. He designs and makes all the jewellery himself, nothing is mass produced so every piece is original and unique. 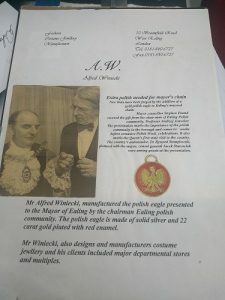 As well as jewellery he’s also made badges to celebrate Poland’s independence and in 1995 produced a Polish Eagle medallion which was presented to the then Mayor of Ealing, (now MP) Steve Pound. He enjoys the daily variety of his work which he says involves anything from repairing a broken necklace to the more complex jobs of designing, making and engraving high end trophies, one such was presented by Prince Philip. When he’s not in the workshop Alfred says he likes to give something back and has been a first aid volunteer with St John Ambulance for many years. 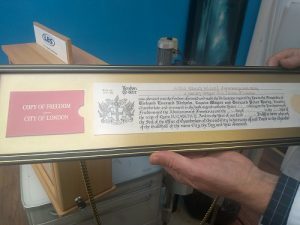 It was through this involvement that he was awarded a rare honour – Freedom of the City of London. This ancient tradition believed to date back to the 13th century once enabled members of a Guild or Livery to carry out their trade or craft in the Square Mile. Free men had the right to trade and carry-on a profession, to own land and earn money in their own right; they could play some part in determining how the city would be governed and they could take sheep to market across London Bridge without having to pay the mandatory bridge toll. Others who have been granted this honour include Bob Geldof, J.K. Rowling, Ian McKellen, and Dame Judi Dench. He says his job is painstakingly intricate, using sharp tools and working in high temperatures, and having a good eye and heaps of patience is basic requirements for such a skilled and specialised craft. If he wasn’t a jeweller what else would he do? Alfred says he has no intention of hanging up his overalls just yet but when the time comes to do so he will most likely be found fishing!